This is an early example of Weissbort’s work, executed either when he was still a student or just after. It is clear that he has been studying Cézanne’s still life paintings very closely, but here he is not imitating the master’s watercolour technique; surprisingly, he is producing an homage to the oil paintings but in the medium of gouache (or water- and body- colour). 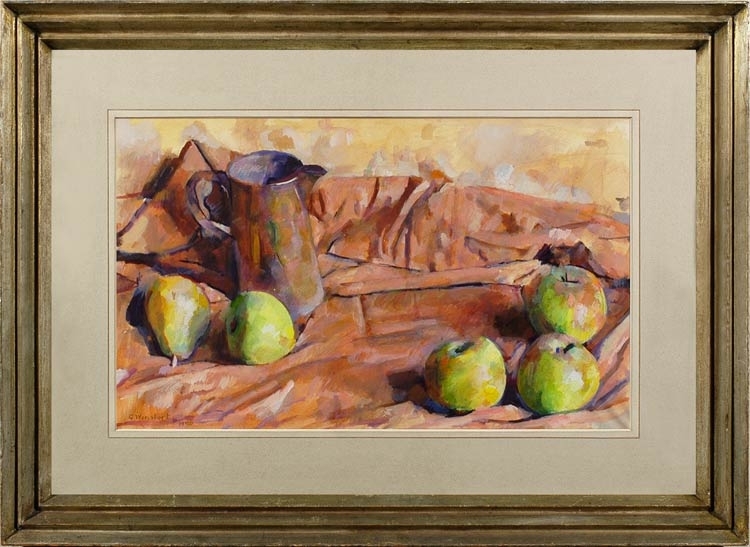 The robust, opaque qualities of this paint allow him to render the forms of fruit, jug and drapery in the same blocky brushwork as he would have used in an oil painting, whilst retaining the clarity and some of the transparency of pure watercolour. As in Cézanne’s Fruit, milk jug and napkin, Musée de l’Orangerie, Paris, Weissbort sets the straight lines of the cylindrical jug against the globes of the fruit and the fortuitous folds of the soft fabric. We see him establishing form and plasticity, and the relationship of objects in space; – yet the result is not an exercise but a satisfying and aesthetically balanced painting.